TeamViewer is a remote assistance software program used by IT Central help desk staff and student technicians to connect to UM faculty, staff and student computers to help troubleshoot and resolve issues. As a security measure, you must give permission through an ID and Password system (explained below) for IT Central personnel to access your computer. Only perform this process when directed to do so by IT Central help desk personnel. On this page, click on Download PC or Download Mac. Choose Open, Run or click on the file (download process differs depending on browser used). If prompted to "allow the following program to make changes," choose Yes. 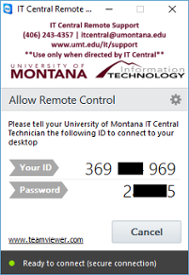 An IT Central Remote Support dialog box will display, providing Your ID and Password. You will be asked to provide Your ID. You will then be asked to provide your Password. The IT member will now have the ability to view your computer screen and control your computer. Once the issue is resolved, we will disconnect from your machine. You will not have to uninstall TeamViewer from your computer once your session is complete. The program runs through your user profile, not through any installation. Check out this knowledge base article I found in the UM Solutions Center knowledge base. https://umt.teamdynamix.com/TDClient/KB/ArticleDet?ID=47821 IT Central Help Desk Remote Support This article assists IT Central help desk in providing remote assistance through TeamViewer. Only use this when instructed by an IT Central help desk technical representative.